After seeing thousands of people in clinical practice, I would estimate that 95% of those who try to go on a gluten-free diet fail. For many of them, it’s not their fault. They follow all the guidelines of eating gluten-free foods like rice, oats, lentils, millet, and sorghum. They find amazing gluten-free cookie recipes with arrowroot and tapioca starch. All the while, they are ingesting tiny amounts of gluten containing grains. How does this happen? It’s called cross contamination and it is far more common than you would imagine. I will never forget Haley, a beautiful 2-year-old girl who came into my clinical practice in 2006. She was suffering from bouts of terrible bloody stools that would have her parents rushing her off to Children’s Hospital multiple times a month. I had suspected food sensitivities, and her parents tried a grain-free and dairy-free elimination diet. The bloody stools stopped. After Haley’s intestines had been calm for quite some time, her mother wanted to reintroduce grains back into her diet and asked what I would recommend. I suggested rice, quinoa, or millet. She went to the local food co-op, grabbed some millet from the bulk bin, and served it up for dinner. Haley went right back to Children’s Hospital. Frustrated with myself, I went to the co-op to see what was wrong. I poured some millet into a plastic bag and sifted through it with my fingers. Sure enough, I saw some grains in there that did not look liked they belonged. Upon closer examination, I saw that they were wheat kernels. Further investigation revealed that lentils, oats, millet, sorghum, and buckwheat are often cross-rotated with gluten-containing crops in the fields. This means that the farmers will rotate the planting of gluten-containing crops on the same land as the gluten-free crops. This leads to a frequent cross-contamination with gluten on those products as they are commonly harvested, stored, transported, and processed on the same machinery. As long as Haley avoided all grains except quinoa and rice, her symptoms subsided. Watch the video below for more case studies and scientific article references that demonstrate the valid concerns for cross contamination. Where Does Cross-Contamination Come From? Take a visit to a farm that grows grains and the process of cross-contamination will become clear. During one part of a growing season, grain farmers will grow a gluten containing grain like wheat, rye, or barley. During another part of that season, over the next year, or in a nearby field, farmers might grow a gluten-free grain like millet, oats, or sorghum, or another crop such as lentils or soy. Those grains may be harvested by the same machinery, stored in the same grain silos, transported in the same vehicles, rolled on the same equipment, or ground into flour at the same mills. As a result, research has shown that up to 32% of “gluten-free” flours and 75% of oats contained significant amounts of gluten in them. Being gluten-free and traveling teaches you a lot. You will learn quickly that most restaurant staff have no idea about cross-contamination. Even fewer understand that fine gluten flours (like pastry flours) will stick to wooden spoons, cutting boards, pots, bowels, and pans. They don’t know that their industrial dishwashing equipment does not remove that flour very well at all. How do I know this? From experience. Ali and I were asked to prepare gluten-free food samples for over 400 attendees at an Autism Research Institute conference in Atlanta. We were delegated some staff and sent back to the hotel kitchen to begin our many hours of preparation. Upon examining the mixing bowls, spoons, and cutting boards, it became clear that they had some caked-on flour residues on them. The staff said that biscuits and pie crusts had been made the week before. I watched as the staff rinsed off the dishes with a high-powered nozzle and placed them in their washing and sanitizing machine. When they came out, they still had residues on them! It took over an hour to re-clean the dishes by hand. Whether the food is prepared on a surface that had gluten on it, fried in a fryer that had gluten-containing products in it, or served with a spoon that came straight out of a tray full of macaroni and cheese, the chances of getting cross-contaminated when eating out is huge. What Can You Do to Prevent Cross-Contamination? Cut out processed foods from your diet. The best way to reduce processed food consumption is to eat whole foods. Increasing vegetable, fruit, and wholesome animal product consumption is an easy way to assure you are meeting nutrient needs while avoiding sources of gluten. Go grain and legume free for 30 to 60 days. This makes it much easier to avoid cross contamination of gluten in other non-gluten grains and flours. If you must include some grains, try adding in quinoa or rice. Andean Naturals and Ancient Harvest Quinoa are both safe from gluten cross contamination. Be careful though of brown rice flour or quinoa flour. They can be milled on the same equipment that gluten grains are milled! It is essential to choose gluten-free flours and grains that are certified gluten-free. Bob's Red Mill made a separate facility where they process their gluten-free flours to assure they will have 19ppm or less of gluten in them. Try an Elimination Diet! We created our elimination diet to make it very easy to avoid cross contamination of gluten in other grains, flours, and legumes. We keep out oats, lentils, millet, and buckwheat from the diet just for this reason! 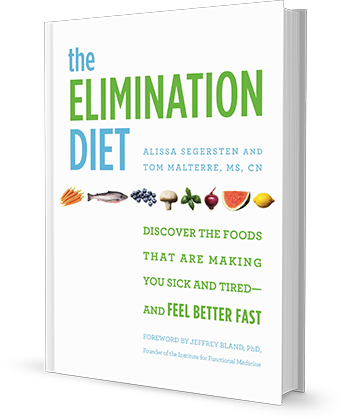 We have a comprehensive Elimination Diet Book, and Elimination Diet Support Program with live webinars and cooking videos. If you want to learn a few staple Elimination Diet recipes that you can incorporate into your everyday cooking, then check out our Free Elimination Diet Cooking Video Series.